This high-efficiency gas furnace includes an air conditioning module, direct venting, and well-insulated ducts to reduce heat and cooling loss. If your home is heated by a furnace or boiler, it's important to get it in working order before winter hits. Nothing is worse than waiting for a repairman in the bitter cold! And when there is any kind of problem with your home heating system, it's crucial that you call in a professional. Dr. Energy Saver can ensure high-quality solutions on every job for all of your furnace or boiler repair needs. All of our local dealers are fully trained and certified in home heating systems. If your furnace or boiler is old and in need of replacement, we can help you find the right heating option for your home. Don't wait until it's too late to repair your home heating system. Contact us today for efficient, effective furnaces and boilers! Furnaces and boilers represent the two largest categories of heating systems used for houses and for buildings in general. The main difference between these two heating appliances is what they heat: Furnaces heat air that is distributed by a ductwork system, which can also distribute cool air from a central air conditioning system during hot summer months. Boilers heat water that is used in different "hydronic" heating systems. So-called "combi-boilers" are designed to supply hot water for washing as well as for whole-house heating. With boiler-based heating, you don't get any ductwork unless your hot water supplies a "hydro-air" forced-air heating system. Propane furnaces: Propane furnaces operate similarly to natural gas furnaces, and new, efficient models can reach 96% energy efficiency - resulting in incredible heating and savings for your home! Electric furnaces: An electric furnace uses electric resistance elements (like the heating coils inside a toaster) to heat air that is distributed throughout the house through a ductwork system. While builders like the affordability, simplicity and low cost of electric furnaces, homeowners soon come to dislike this heating option because electricity is very expensive to use for whole-house heating. A good HVAC system upgrade to consider is switching to a heat pump system. A heat pump consumes electricity but performs much more efficiently than an electric furnace. Forced air furnaces: A forced-air furnace can use electricity, fuel oil, gas, propane or even wood or pellets as a heat source. Regardless of the heat source used, all forced-air furnaces depend on a ductwork system to distribute heated air throughout the living space and also to bring cooler air back to the furnace where it is reheated. Additionally, duct sealing improves the efficiency of any forced-air system. Gas furnaces: Gas furnaces have a long track record as reliable, whole-house heating systems. This type of furnace burns either natural gas or propane fuel. Propane is more commonly used in rural areas where natural gas lines have not been installed. Gas boilers: Like other gas appliances, a gas boiler can be adapted to burn natural gas or propane gas. Despite the name, most gas boilers don't actually boil water; they just heat it. Then the hot water is pumped to radiators, radiant-floor tubing, or to a heat exchanger. All of these heating systems are referred to as hydronic (water-based) heat. Oil boilers: Oil boilers work exactly the same as gas boilers, but use oil as their fuel. Invest in a "combi-boiler" if you're looking for home heating and hot water. Oil furnaces: The oil furnace is one of the most common heating systems. It's used more frequently as a heating option throughout New England and in other areas of the country where natural gas isn't available. All oil furnaces supply forced-air heating. The furnace is connected to a ductwork system that delivers heated air to living areas and returns cooled air back to the furnace for reheating. BTU output tells you how much heat the furnace or boiler can produce. BTU output is listed in thousands of BTUs (80,000btu, for example). Annual Fuel Utilization Efficiency is the standard measure of efficiency for boilers and furnaces. Given as a percentage, AFUE tells you how much of the input energy the unit can convert to output energy for warming your home. Combustion denotes the way that combustion air is supplied and the way that combustion gasses are vented. Atmospheric, direct-vent, and sealed-combustion are all kinds of combustion models. If you're concerned about the state of your furnace or boiler, there's no better company to call than your local Dr. Energy Saver dealer. Our certified contractors know proper repair and maintenance techniques to give your home the best comfort possible. 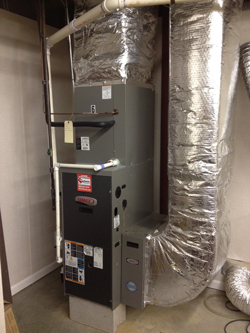 Additionally, our dealers can install brand new, high-efficiency boilers and furnaces in your home. A new furnace or boiler can be up to 20% more efficient than an older model, meaning less expensive energy bills and more money in your pocket. Schedule a free estimate or a home energy audit with your local dealer today, and find out what furnace or boiler solution is right for you!